I'm sure many of our readers are on some sort of pills. Sadly it almost seems inevitable as we grow older. What's that got to do with our beloved steam toys? I hear you cry. Well I'd like to introduce you to one of my little "pop pop boats" that comes with its own medication! 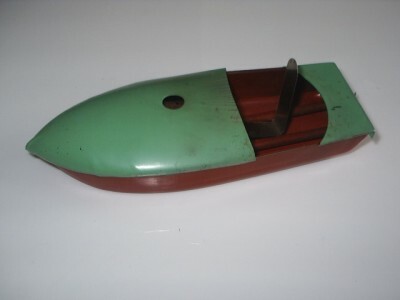 Sounding more like an American Diner or a brand of ice cream, this little 6" long boat (see below) was retailed by "Joni & Gerri Toys", of Cincinatti, Ohio, U.S.A., probably in the late 1940's. 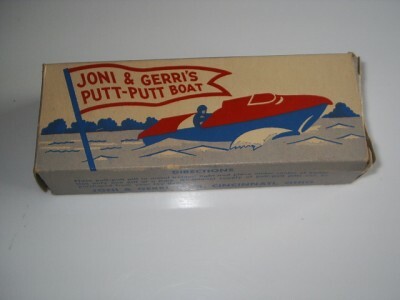 The box (see below) describes it as Joni & Gerri's Putt Putt Boat and the end flap indicates No. PT-1. Now on to the medication. 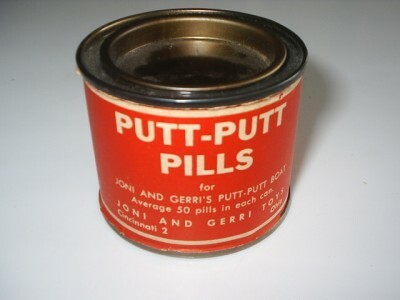 The directions on the box read "Place putt-putt pill in metal holder, light and place under centre of boiler. Use only one pill at a time. Additional supply of pills can be purchased from your toy dealer". When I purchased this boat it had a tin of pills with it (see above). Average contents 50. The pills really are quite small and I was intrigued to see whether they were past their sell by date, which was probably 60 years ago! I don't often run my vintage boats, keeping them purely for display, but I thought I would give it a whirl. I primed the pipes in the boat, placed it in the water then, after a couple of attempts managed to light one of the pills. It smelled very much like the "Mamod" type tablets. The burned with a wide flame providing a good area of heat under the boiler. I achieved some propulsion. However after removing the "engine cover" I discovered a leak in the system, which rendered the performance less than impressive. Many fuels have been used to power pop pop boats including sterno, meths, metaldehyde, candles, olive oil, but this is the only boat I have found so far with its own dedicated tin of pills. I don't know the cost of these pills, but 50 voyages from one tin can't be bad!